Once per Chain, during your opponent’s Main Phase, you can (Quick Effect): Immediately after this effect resolves, Synchro Summon using this card you control. You can only use each of the following effects of "T.G. Star Guardian" once per turn. ● If this card is Special Summoned: You can target 1 "T.G." monster in your GY; add it to your hand. ● During your Main Phase: You can Special Summon 1 "T.G." monster from your hand. This monster resembles Antinomy, and his Duel Runner, Delta Eagle. This monster's pose is almost the exact same pose as T.G. Trident Launcher, the only difference is that their positions are mirrored. 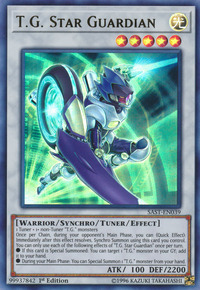 Additionally, this card's DEF is the same as Trident Launcher's ATK.